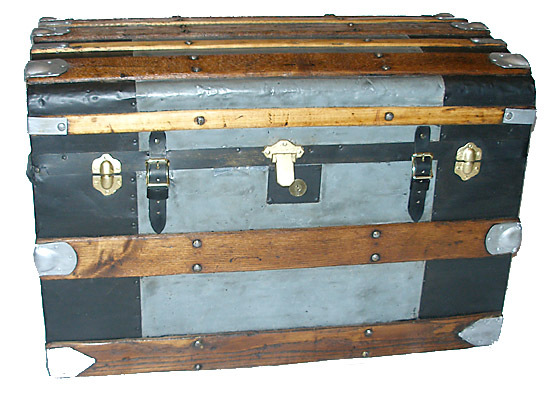 Rare Expedition Zinc Covered Trunk. This type of trunk is perfect for many styles of decor, and highly sought after. This Zinc covered Rare trunk is a real beauty. Simple Elegance in very solid well built construction makes this one special. Made in Europe in the 1860’s – 1880’s time frame (dated by the lock), this one has been cleaned to the zinc finish (a nice bluish/gray patina), and the wood slats and interior all sanded to a smooth finish, and re-stained with a warm mahogany / walnut stain mixture on the larger slats, and a light natural finish on the small slats which is what we believed was the original look based on the trunk what we found in the refinishing process. These with 2 different sizes of slats are more rare types. The front leather straps and buckles have been replaced with new reproduction straps to look like the original top sections. The side handles and handle ends have been replaced with high quality reproduction types. All the hardware is Very well built and substantial. We only see very few of these, and almost never in this condition. There is a small area of zinc metal loss on the front below the metal cross banding, and we colored the wood to match the metal loss. In the main photo, you can see it is basically unnoticeable, but we also have another photo with arrows pointing to it to show where it is so you can see it. This will be great to use in multiple decorating situations, French country, Classic country, old world, western, etc. Dimensions 32"L X 20"W X 20 1/2"H at the top of the curve. Please look at the photos for the Condition.